Even though they're old-fashioned, geraniums are still a top pick for hot, sunny spots -- and they mix well with just about everything. (No wonder they're tried-and-true favorites.) This red geranium is dressed up with a flowing skirt of draping ivy and blue lobelia and a top hat of a simple dracaena for a classic look. Create drama in your landscape with a container that mixes several shades of your favorite color. 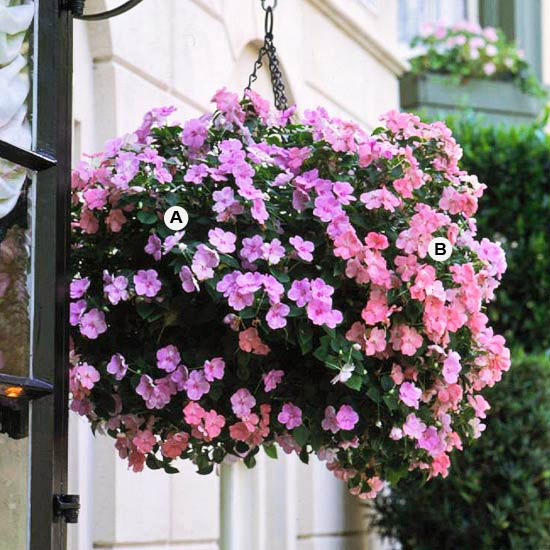 Here, hues of pink fill out and trail down the sides of this hanging basket. We love the inclusion of the coleus; its deeply colored foliage adds beautiful depth to the planting. Grow this beautiful basket in a spot with full sun. Create a virtually no-care container with succulents. 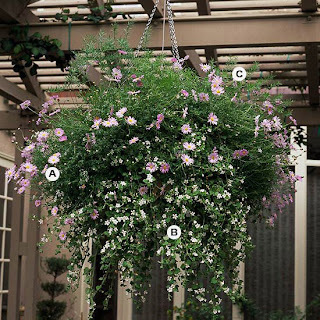 We've found the biggest challenge of growing beautiful hanging baskets is keeping them from drying out. 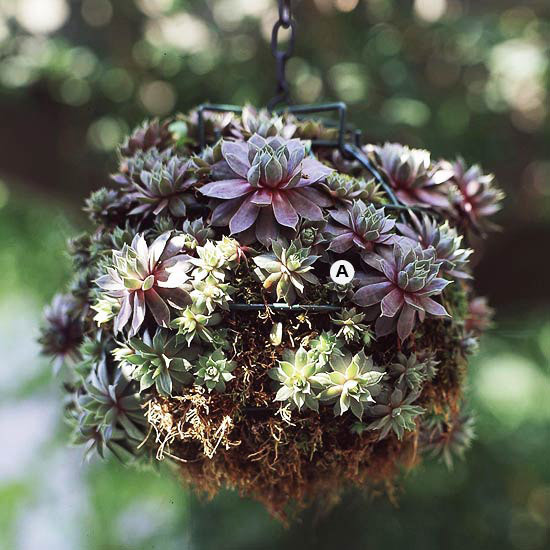 You can make maintenance a breeze with a planting of drought-tolerant hens and chicks, echeveria, sedum, or other succulents. 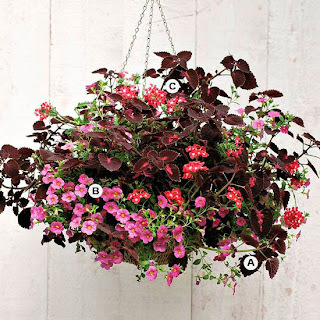 They're an unusual choice, but require next to no watering, even in hot, sunny situations. It's tough to pick which is brighter -- the hot pink or the bold gold. Either way, they're great colors to catch the eye from a block away. Up close, the mix of bloom sizes creates visual interest on a more subtle level. Tip: If your home is set back on your lot, choose bright colors to create more impact from the street. Plants with small foliage and flowers create a fine texture that adds a touch of subtlety to your landscape. We love this simple but effective combination -- it's like a touch of snow in summer. This basket is best in full sun. 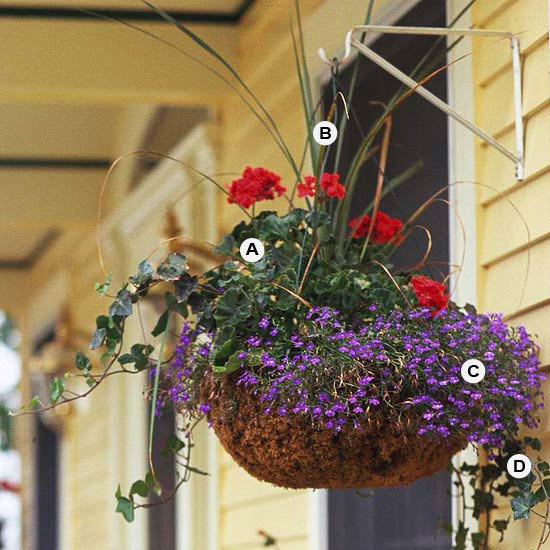 A lot of the baskets we've shown you rely on a bunch of different plants for creating contrasts in color or texture. But you can create equally good looks without going overboard. 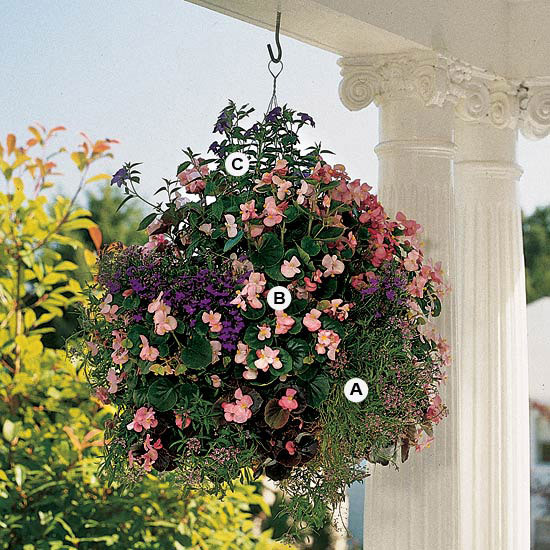 If plant choices feel overwhelming, choose a classic such as shade-loving impatiens and fill a hanging basket with their delicate-looking blooms all summer long. If bold, traffic-stopping colors aren't for you, put together a basket full of elegance with soft, pastel colors. 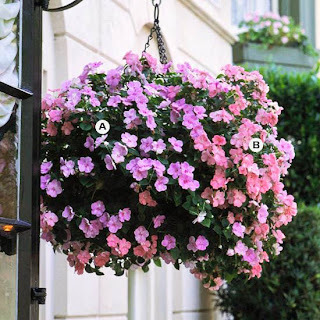 (Soft shades of pink, lavender, and blue are especially useful for helping hot, exposed spots seem a bit cooler.) Here, trailing plants, such as verbena create a soft, beautiful display perfect for gardens of any style -- from cottage to formal. This basket is best in full sun. Create a "wow" moment by using colors that are opposite each other on the color wheel. Here, for example, rich purple makes a stunning contrast to golden-chartreuse. This basket does best in full sun. By the way: This container looks as good as it smells; heliotrope is one of the most fragrant flowers you can use in hanging baskets. 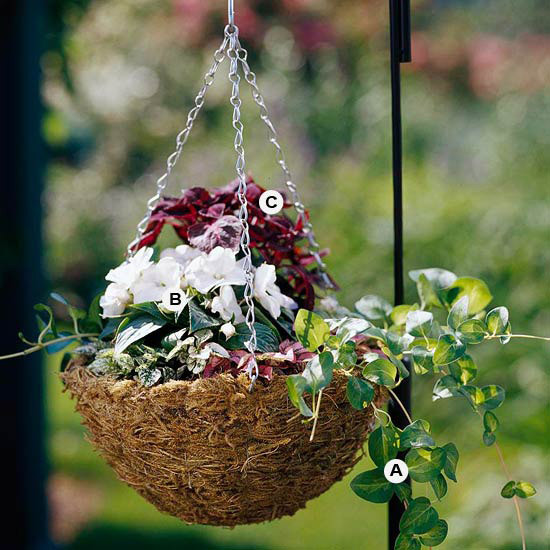 Small baskets can create as big an impact as their bigger cousins -- you just need to pick plants carefully. A secret for success is to practice restraint. Instead of trying to pack in a bunch of different colors and shapes, unify your planting with just one plant of a couple of varieties. 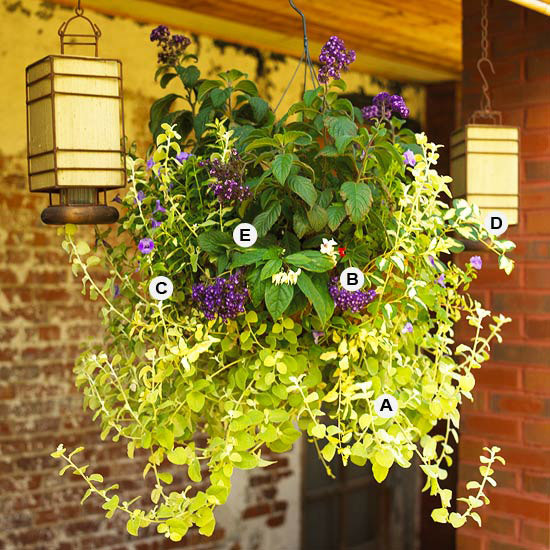 This is a great way to add color to a shady spot. Lights. Camera. Action! 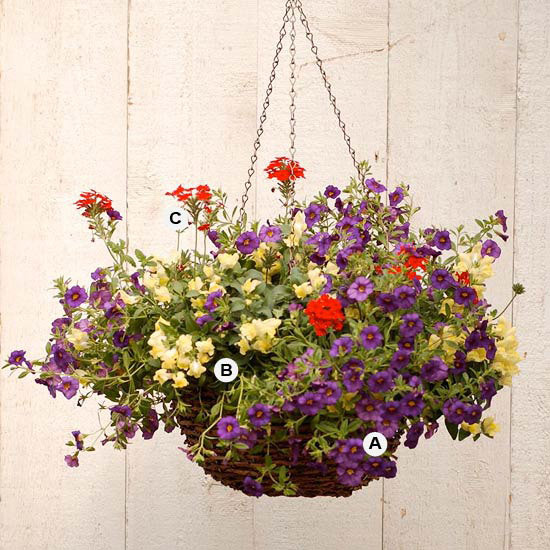 Super bloomers like sun-loving verbena and calibrachoa are ready to start putting on a show as soon as you plant them. 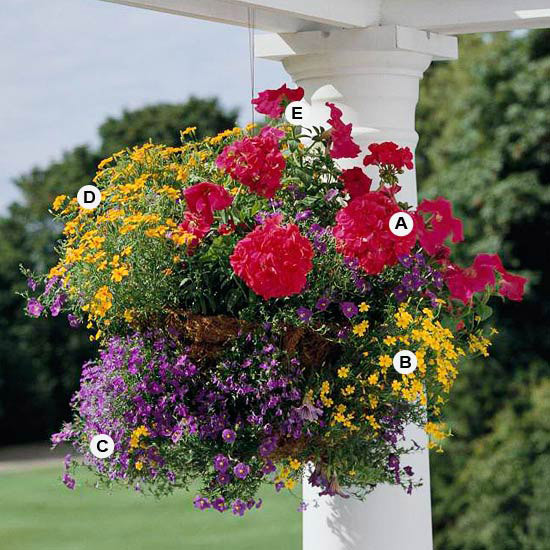 They're dependable performers and will keep up their starring role in your landscape all summer long.